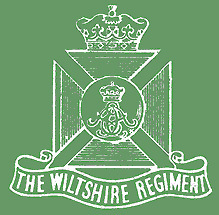 The Regiment consists of two former Regiments of Foot, the 62nd and the 99th, which were linked together under the Cardwell system in 1881 as the Wiltshire Regiment, the 62nd becoming the 1st Battalion and the 99th the 2nd Battalion. The two Battalions were amalgamated in Germany in 1948 and in 1953 HM The Queen graciously gave permission for Philip, Duke of Edinburgh, to become Colonel-in-Chief of the Regiment, as the 1st Duke of Edinburgh had been for the 99th Regiment of Foot. Early in 1950 members of the Association, Fovant Home Guard Old Comrades, decided to cut out the badge of the Wiltshire Regiment – the cap badge that they had worn during the war as members of the Home Guard – and with the permission of the Colonel of the Regiment, this very fine badge joined the others.